We are Richmond’s full service gutter company. We install seamless gutters in both 5” and 6”, aluminum and copper, and half round or k style. All of our products are custom made and installed with the highest quality materials and craftsmanship in the market place. 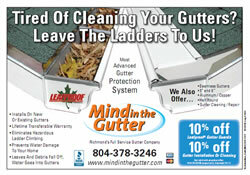 We also offer two gutter protection products to best fit your house and budget – Leaf Proof, and Leaf Exterminator. In addition to adding new gutters and guards to your home, we also offer gutter repair, gutter cleaning, gutter polishing, and exterior carpentry. 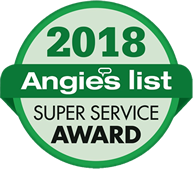 Our award winning company is locally owned and operated near Midlothian, VA, and proudly serves the entire Richmond Metro area and beyond. For a FREE consultation visit our CONTACT US page or call us at 804-378-3246. Mind in the Gutter is a member of the Better Business Bureau, licensed by the state board of contractors # 2705-127135 and fully insured.